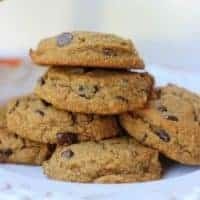 Soft, moist, grain-free, spiced pumpkin cookies full of chocolate chunks. A fall classic. Using a hand or stand mixer, cream together the palm shortening, coconut oil, and coconut sugar until light and fluffy. Add the pumpkin, eggs, and vanilla and blend until smooth. If your coconut and almond flour and lumpy, as mine often are, sift them together before adding them to the mixture. Add all the dry ingredients and mix to combine. Stir in the chocolate chips. The dough will look wet. Scoop the cookie dough onto the baking sheet. With wet hands, slightly flatten each cookie as they will not spread much during baking. Bake for 12-14 minutes. Cool on the tray for 5 minutes. Enjoy!